WALLACE: So how much would it cost? WALLACE: No no, I’m just talking about cuts. We’ll get to the deductions, but the cut in tax rates. RYAN: The cut in tax rates is lowering all Americans’ tax rates by 20 percent. WALLACE: Right, how much does that cost? WALLACE: But I have to point out, you haven’t given me the math. RYAN: No, but you…well, I don’t have the time. It would take me too long to go through all of the math. But let me say it this way: you can lower tax rates by 20 percent across the board by closing loopholes and still have preferences for the middle class. For things like charitable deductions, for home purchases, for health care. So what we’re saying is, people are going to get lower tax rates. “No one can say my plan is going to raise taxes on middle-income people, because principle number one is (to) keep the burden down on middle-income taxpayers,” Romney told host George Stephanopoulos. “Is $100,000 middle income?” Stephanopoulos asked. “No, middle income is $200,000 to $250,000 and less,” Romney responded. No wonder this guy makes $10,000 bets at the drop of a hat. Everyone knows that’s like a normal two-week paycheck for middle class folks. This year’s campaign on behalf of fossil fuels includes a surge in political contributions to Mitt Romney, attack ads questioning Mr. Obama’s clean-energy agenda, and television spots that are not overtly partisan but criticize administration actions like new air pollution rules and the delay of the Keystone XL oil pipeline from Canada. Now our most powerful and wealthy corporate “people” can dominate the political landscape in a truly Randian paradise. We’re almost there, just another few years of tax cuts, attacks on unions, and a few more years of high gas prices and the future residents of Galt’s Gulch will finally have the firm grasp on the reins of power they’ve always known they should have. Federal Reserve Chairman Ben Bernanke doesn’t care about Capitol Hill or campaign-trail bullies. He has said repeatedly as the central bank has come under a political magnifying glass this year: The Fed bases its decisions on economics, not politics. On Thursday, the Fed chairman backed up that assertion with action. The Fed has two goals, full employment and low inflation. Right now inflation in under control, employment is not. Had the GOP done something to improve the employment situation rather than try to make political hay out of it, we might not need the easing. As it stands, it seems evident someone needs to do something. With the GOP blocking everything else, this is about the only rational way to make some progress. First up, we start in conservative media fantasy-land. THR: Does the media tie mistakes made by Democrats to President Obama as readily as they tie Republican mistakes to Romney? Wallace: Yes, the mainstream media is terribly unfair to Obama, and they have to stop their bias in favor of Romney. Next up we see what is driving ratings for Fox News. Obama is not simply America’s first black president—he is the first president who could credibly teach a black-studies class. He is fully versed in the works of Richard Wright and James Baldwin, Frederick Douglass and Malcolm X. Obama’s two autobiographies are deeply concerned with race, and in front of black audiences he is apt to cite important but obscure political figures such as George Henry White, who served from 1897 to 1901 and was the last African American congressman to be elected from the South until 1970. But with just a few notable exceptions, the president had, for the first three years of his presidency, strenuously avoided talk of race. WASHINGTON, D.C. — When GOP presidential candidate Mitt Romney visited an Ohio coal mine this month to promote jobs in the coal industry, workers who appeared with him at the rally lost pay because their mine was shut down. The Pepper Pike company that owns the Century Mine told workers that attending the Aug. 14 Romney event would be both mandatory and unpaid, a top company official said Monday morning in a West Virginia radio interview. We need to develop a “canary in the convention” that falls over dead when the b.s. gets too deep. Speaking of b.s. at the convention, here’s the Rolling Stone piece that looks a bit deeper into how Mitt Romney’s Bain Capital made its start, and how it was saved in the early years by a taxpayer bailout. And this is where we get to the hypocrisy at the heart of Mitt Romney. Everyone knows that he is fantastically rich, having scored great success, the legend goes, as a “turnaround specialist,” a shrewd financial operator who revived moribund companies as a high-priced consultant for a storied Wall Street private equity firm. But what most voters don’t know is the way Mitt Romney actually made his fortune: by borrowing vast sums of money that other people were forced to pay back. This is the plain, stark reality that has somehow eluded America’s top political journalists for two consecutive presidential campaigns: Mitt Romney is one of the greatest and most irresponsible debt creators of all time. In the past few decades, in fact, Romney has piled more debt onto more unsuspecting companies, written more gigantic checks that other people have to cover, than perhaps all but a handful of people on planet Earth. In the background, quietly crying, you’ll find our environment. Yesterday was August 28th 2012. Remember that date. It marks the day when the world went raving mad. Three things of note happened. The first is that a record Arctic ice melt had just been announced by the scientists studying the region. The 2012 figure has not only beaten the previous record, established in 2007. It has beaten it three weeks before the sea ice is likely to reach its minimum extent. It reveals that global climate breakdown is proceeding more rapidly than most climate scientists expected. But you could be forgiven for missing it, as it scarcely made the news at all. •Accused President Obama‘s health care law of funneling money away from Medicare “at the expense of the elderly.” In fact, Medicare’s chief actuary says the law “substantially improves” the system’s finances, and Ryan himself has embraced the same savings. •Accused Obama of doing “exactly nothing” about recommendations of a bipartisan deficit commission — which Ryan himself helped scuttle. •Claimed the American people were “cut out” of stimulus spending. Actually, more than a quarter of all stimulus dollars went for tax relief for workers. •Faulted Obama for failing to deliver a 2008 campaign promise to keep a Wisconsin plant open. It closed less than a month before Obama took office. •Blamed Obama for the loss of a AAA credit rating for the U.S. Actually, Standard & Poor’s blamed the downgrade on the uncompromising stands of both Republicans and Democrats. This is not true. According to American Bankruptcy Institute, under Carter 331,264 businesses and non-businesses filed for bankruptcy. That number includes not just businesses, but personal bankruptcies as well. In 1980, there were 43,694 business bankruptcies and 287, 570 non-business bankruptcies. Ryan also got it wrong with regard to the number of business bankruptcies last year. In 2011, there were 1, 410, 653 total bankruptcies. Of that number 47,806 were business bankruptcies and 1,362,847 were non-business bankruptcies. and just to keep it in perspective, Paul Ryan is being sold as the gold standard in Republican honesty and integrity when it comes to numbers. Really. Here’s a bit of the “liberal” media conspiracy…in that we have an actual liberal calling out the media for keeping certain things from the eyes of the public. When Mitt Romney walked down the aisle toward the stage Thursday night, among the people whose hands he shook was the conservative billionaire and major political donor David Koch. But it was a moment missed by the tens of millions of viewers at home. While Democracy Now! was there on the floor and captured the handshake on video, the networks cut away just before the handshake to show footage of two enthusiastic young women supporters and then an overhead shot of the convention center. You can even see Mitt’s face light up when he sees the Koch. Heading back to that Rolling Stone story about how firms like Bain avoid paying taxes on their income…the NY State Attorney General (the one after the whore-monger) is now looking into the practice of treating wealthy and connected people’s labor as if it were capital (and thus getting a 20% tax break, from 35% down to 15%). The New York attorney general is investigating whether some of the nation’s biggest private equity firms have abused a tax strategy in order to slice hundreds of millions of dollars from their tax bills, according to executives with direct knowledge of the inquiry. The attorney general, Eric T. Schneiderman, has in recent weeks subpoenaed more than a dozen firms seeking documents that would reveal whether they converted certain management fees collected from their investors into fund investments, which are taxed at a far lower rate than ordinary income. According to financial statements, Bain partners saved more than $200 million in federal income taxes and more than $20 million in Medicare taxes. Thus goes the “secret to his success”. And finally we see a Business Insider story that hits the nail on the head. The following charts clearly illustrate that problem. 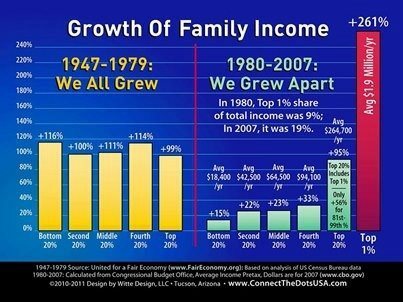 This is the natural results of 30+ years of supply-side economics. Here we see the real world effect of “supply side” economics. And there you have it. Links dumped. Just in case you were beginning to think rich people were deeply misunderstood and that they feel the pain of those who are less fortunate, here’s the world’s wealthiest woman, Australian mining tycoon Gina Rinehart, with some helpful advice. Yeah, let them eat cake. Rinehart made her money the old-fashioned way: She inherited it. Her family iron ore prospecting fortune of $30.1 billion makes her Australia’s wealthiest person and the richest woman on the planet. CLEVELAND — Republican vice presidential nominee Paul Ryan declined on Tuesday to back away from statements in his party convention speech that nonpartisan fact checkers have branded as false or misleading. In a round of television interviews, the Wisconsin congressman was challenged by network anchors to defend statements on Medicare, the federal deficit and the 2008 closing of a GM plant in his hometown, Janesville. At least folks are making that first step. The idea is to make sure and mention that every fact checking group has rated his statements lies, do so both to his face, and again after the interview is done. That’s the media’s job. If Paul Ryan “rounds” a four hour plus marathon time down to two hours and fifty minutes…what other things is he lying, err, rounding about? A) How many times in the history of the U.S. have we had 10 years of 5%+ GPD growth and 2% unemployment? B) How many times does Paul Ryan assume we will if we adopt his budget? And that is from the guy that “rounded” about a third off his marathon record…starting to become clear what Ryan is yet?